Having a small walk-in closet in your bedroom can feel like a curse, especially if there is not enough room for all your stuff. From racks to rods, and drawers to bins, the following ideas will help you optimize every square inch of your closet with purposeful storage solutions. There are no rules that state small walk-in closets cannot be super stylish. Case in point, this glamours example by Kelly, the do-it-yourselfer behind the blog View Along the Way. Her goal was to create a seriously feminine closet stuffed with practical storage solutions—and she nailed it! DIY built-ins made optimizing her closet's skimpy square footage possible. 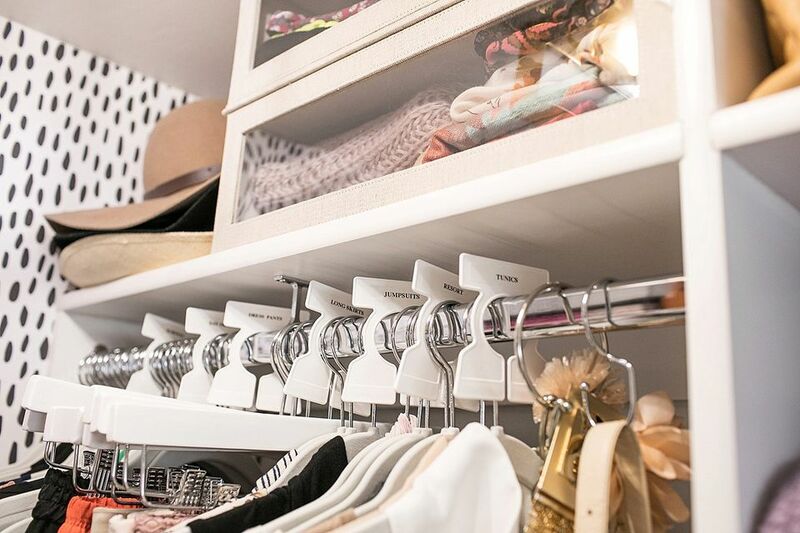 The right side of her closet features two separate nooks for jewelry for handbags. There are also three drawers for additional accessories. On the left side of her walk-in, cabinet, cubbies, and shelves carve out room for sweaters and shoes. A gorgeous crystal pendant light overhead brings a little bling while pretty peony wallpaper layers on girlie glam. We get that many people do not have the budget for custom closet storage—not to mention gorgeous wallpaper. That is why we love this small walk-in closet transformation by Nicole from The Inspired Hive. Before adding practical storage, she faked the look of expensive wallpaper using a stencil and paint. Her project cost less than $30. Next, she installed affordable wire shelving by Closet Maid. A shelf that measures 72-inches wide and 12-inches deep is less than $10. The best part? You can cut it into shorter pieces—win! Simple and stylish, white cardboard boxes from IKEA keep seasonal items concealed from view. A small dresser and an end table with drawers add more room to hold stuff. The full sized mirror on the left is a must-have feature for any bedroom walk-in closet. A semi-flush mount light fixture called Livex Brighton brightens the space. The finishing touch is a machine washable rug. When you spend a lot of money on shoes and accessories, you want to protect your investment. That's why we love these closet organization ideas from Deborah Broockerd at Closet Factory based in Vienna, Virginia. Notice the tall boots on the shelf? Little hangers prevent creases. On the right, scarves are folded neatly before hanging. Storing them this way prevents knitted yarn from snagging or sagging. Finnish influencer and décor trendsetter MK Maison created the organized closet of her dreams using pieces from IKEA's KALLAX collection. The large shelving on the left holds folded clothing. The box inserts for the lower cubbies whip up concealed storage. A smaller KALLAX unit placed in a corner displays accessories. To the right are two closet rods. The finishing touches are the full-length mirror and floor pouf. Both make the small closet feel more like a luxurious changing room. We love this dreamy bedroom closet makeover by Lindi at Love Create Celebrate. On the ceiling are weathered peel and stick wood planks by Stikwood. The floors were also given a lift thanks to new porcelain tiles. The white storage units came from IKEA. Smartly placed LEDs light up the cabinetry when needed. Not shown in the photo is the closet's sliding barn door. Melissa from Shabby Chic Cottage covered the walls in her bedroom closet with Cedar Safe Closet Liners. They are real planks of aromatic cedar wood that repels moths, cockroaches, and mildew the natural way. She says they took roughly six hours to install. Two stacked shelving units on the right add plenty of cubby storage. A rod at the back of the closet on the left (not shown) provide lots of hanging space. An inexpensive bath mat is a plush touch that feels super soft underfoot. A pretty wallpaper pattern called Great Wave by Cole and Son's inspired the look of this custom closet in Cristin Bisbee Pries's home. She's the organization expert who created the blog, Simplified Bee. All of the storage solutions in Cristin's walk-in is by EasyClosets. She used the company's free online tool to design her space. The veneer on the custom cabinetry has a driftwood finish that beautifully compliments the wallpaper's ocean theme. Several natural accents including the jute rug and seagrass baskets add beachy charm. Lisa, the blogger who pens Garrison Street Design Studio created a functional walk-in closet using select pieces from IKEA's PAX closet system. It allowed her to add personalized solutions to her space at a fraction of the cost for custom built-ins, which could easily cost between $5,000 and $10,000. How much did Lisa spend? Less than $1,000. She is particularly fond of her new accessory drawers shown on the left. They house her growing collection of designer sunglasses. This stellar walk-in closet makeover by Krista at The Happy Housie cost much less than you think thanks to inexpensive removable wallpaper and cherry-picked items from IKEA's PAX Closet System. After installing the latter, she was shocked by the amount of stuff that could suddenly fit inside. So much, in fact, that Krista was able to ditch one of her bedroom dressers entirely. On the walls is a wallpaper pattern by Walls Need Love called The Palms in White. The easy to find design cost $24 per roll. Another need to know, it can be used over and over again and is guaranteed to restick to walls up to 99 times. On the floor is an inexpensive runner rug from Joss and Main. After paring her belongings down to the bare essentials, Nina, the Norwegian blogger behind the interior design site, Stylizimo made over her walk-in closet. The result is a space that feels fresh, airy, and thoroughly organized. On the back wall are three shelves and a single closet rod. A white dresser on the right is for folded clothing and seasonal items. On the right, five stainless steel rails from IKEA's GRUNDTAL kitchen series creates a nook to hang high heeled shoes. These tips from Diana at Diane Elizabeth Blog will help you make the most of your tiny closet. After emptying out the teensy walk-in, she decided to make the most of the vertical space. To do so, she added additional storage solutions on top of the existing built-ins. Next, she personalized the area with removable wallpaper and a new flush mount ceiling light. Afterward, she replaced her wood closet rods with chrome ones. It was a smart move that elevated the look and feel of the small closet. To keep the updated space feeling light airy she swapped out her black velvet hangers for white ones. Next, she added labeled garment organizers to keep hanging stuff organized. Lastly, we love how Diana put her closet door to work (shown on the right) with a hanging shoe rack. Put another notch in your tool belt with this DIY closet system by Kristi at Making it in the Mountains. Her cubby styled units are both functional and beautiful. She said what makes the system so ingenious is that it is 100 percent customizable by changing the configuration or layout of the wood boxes. The main ingredients for this project are birch plywood boards. You will also need several tools including a saw and power drill. Erin Gates Design out of Newton, Massachusetts used a few simple tricks to bring order to this small walk-in closet in a classic Colonial home. A shelf over the closet rod creates room to stash folder sweaters and other seasonal items. On the floor, a simple shoe rack triples the amount of space reserved for flat and pumps. The beautiful crystal light fixture overhead is both practical and stylish. Jona Brisske is the New York City interior designer who created these two small walk-in closets in a Brooklyn townhouse. On the left is the walk-in for the master bedroom. Every spec of vertical space is optimized with practical storage. Floor to ceiling shelves makes room for dozens of shoes. Four closet rods strategically placed carve out nooks for hanging clothing. Because space is super tight, the pants were folded over hangers. We appreciate that the top shelf on the right is big enough to fit two suitcases. The closet in the home's second bedroom has a different layout. On the right are built-in shelves that house a sizable sneaker collection. The closet rod on the left has ample room for long dresses. On the left is a second closet rod for shirts and folded pants. Cubbies and drawers on both sides of the walk-in are reserved for accessories and seasonal items. Another nice feature in this space is the sliding closet door with a full-length mirror. Fans of retro industrial décor will adore this pipe closet organizer tutorial by Katie at Domestiphobia. First, she painted the bedroom closet a gorgeous shade of teal. Before whipping up the shelving, she measured the walls and marked the wall studs. After mapping out the design, she assembled the galvanized steel pipe parts and installed them. The final step was adding the stained wood shelves. Underneath this custom loft bed in an apartment, spotted on De La Haye Makelaardij, is a small walk-in closet. Inside are two stacked cabinets and one dresser. All of the pieces are from IKEA's IVAR series. Granted this enviable bedroom closet is spacious. But it is brimming with tips worth stealing for your small walk-in. Emily Johnston Interiors out of Dallas, Texas install custom built-ins to maximize every square foot. Rows and rows of shelves get shoes off the floor. Cabinets with glass doors keep seasonal clothing dust-free. Lucite boxes on the far right top shelf keep stored items visible, so they are not forgotten. In this small, but not tiny abode called the Harpoon House, a loft style lounge creates room for a walk-in closet in the master bedroom. The simple layout is a cinch to recreate using boards, shelves, and a closet rod. Don't have a closet in your bedroom? Than fake one with these suggestions from IKEA IDEAS blog. Here an assortment of storage solutions turns a blank wall into a walk-in closet. Curtains that extends the length of the room helps to keep things out of sight. In a children's bedroom by Erin Gates Design, a shallow closet feels more like a walk-in thanks to a smart, closet organization system. Units like these make it a snap to create compartmentalized storage solutions for a wide range of items. Here shelves make room for shoes and accessories. A short closet rod creates space for dresses and jackets. Underneath is a stylish hamper. On the top shelf are baskets that keep seasonal items out of sight. A fun feature is the adorable bow rack on the left that keeps pretty ribbons nicely organized. Deborah Broockerd, the organization expert at the Closet Factory out of Vienna, Virginia has a few smart tips for storing jewelry in a small walk-in. On the left, she put empty vertical space in a closet to good use by creating a stunning necklace wall. To follow her lead you can use peel and stick plastic wall hooks. Tired of untangling delicate necklaces? In the second walk-in closet shown on the right, an assortment of chains, pearls, and beads are kept neat and tidy on velvet boards that slide out when needed.